According to this documentary, they found associations (remember the limits to associations tho!) between how old a person looked and their blood sugar levels when people were asked to judge how old they perceived a photograph of a person was. As you might guess, people with higher blood sugars looked older than what they really were. So how could this be? The documentary mentioned it has to do with the way sugar attaches to the collagen in our skin – causing the skin to become more brittle. The documentary doesn’t go deeper than that but TheFatNurse suspects they are referring to AGEs (Advance Glycation End Products) which are worth a post just by themselves in the future. Posted on July 23, 2012 by thefatnurse Tagged c reactive proteinDietDr. Attialow carblow fatLow GIMedia	CommentsNo Comments on Read the Actual Studies! This situation was actually a few weeks old, but you may remember the news media all abuzz about a study on lowcarb vs low GI vs low fat diets. At the time TheFatNurse was busy finishing the HDL For All Ages comic and didn’t get a chance to read the study. However, that didn’t stop TheFatNurse from encountering people saying lowcarb high fat was deadly. You can see an example of this in the comic below. So where did they get this idea? Apparently some of the news media reported that the low carb diet had increased amount of C-reactive protein which can be (although not the ideal marker) an inflammation marker for heart disease. However, the CRP was increased relative to what? Relative to the baseline? Not at all. Their was an improvement from the baseline value! Additionally, even tho their was a higher CRP in the low carb relative to the low fat, both values were below the 1.0 mg/L range that indicates low risk for developing cardiovascular disease. Anyways, TheFatNurse was gonna write a post about the actual study but Dr. Attia has already broken it down very nicely. 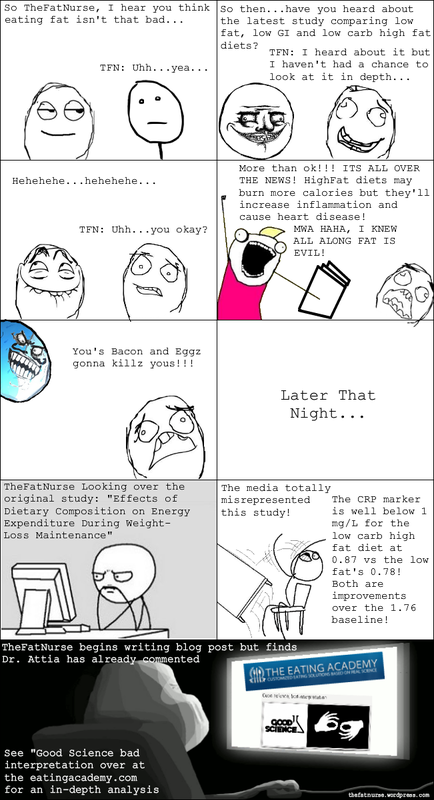 So TheFatNurse made a comic instead. One of the things TheFatNurse has noticed about eating a reduced carb and high fat lifestyle is the drop in blood pressure TheFatNurse is experiencing. Seriously, TheFatNurse has gone from an average of 124/75ish to…110/62…what the hell…time to look into this mofo. This is an older study in the Arch of Intern Med from 2010 that is pretty interesting (1). It compared a low carb diet to a low fat diet + Orlistat. This drug works by preventing the absorption of fat and therefore reduce calories. Of course if you ain’t absorbing it…it’s gotta come out somewhere right? Thus, one of the potential “treatment effects” is fat oily and foul smelling stools known as steatorrhea. 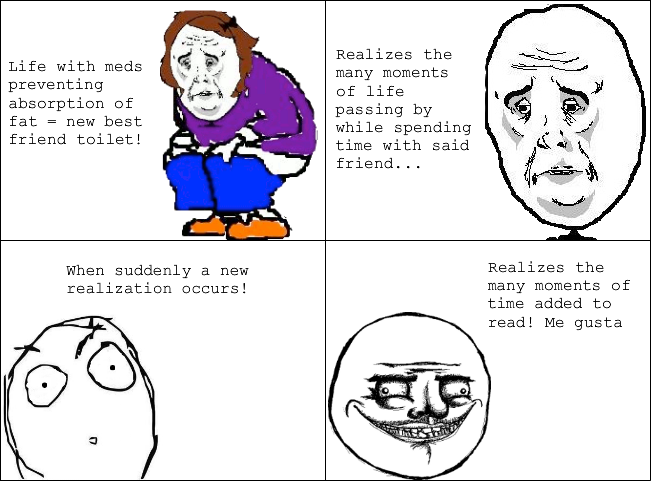 Yea…TheFatNurse has random thoughts…Deal with it! The researchers were looking to see what sort of metabolic, body weight and adverse effects these two diets would have in a 48 week period in overweight subjects with some having obesity related problems such as diabetes, lipid issues and hypertension. However, despite the low fat diet having a leg up with medication versus the low fat diet, the researchers still predicted the low carb diet would make participants lose more weight. Participants were instructed to restrict carbohydrate intake initially to less than 20 g/d using pocket guides and hand- outs. Participants could eat unlimited meat and eggs, 112 g of hard cheese, 0.48 L of low-carbohydrate vegetables (eg, leafy greens), and 0.24 L of moderate-carbohydrate veg- etables (eg, broccoli, asparagus) daily; calorie intake was not restricted. Participants were instructed to restrict intake of total fat (<30% of daily energy), saturated fat (<10% of daily energy), cholesterol (<300 mg daily), and calories using pocket guides, hand- outs, and individualized goals.13,14 Recommended calorie in- take was 500 to 1000 kcal below a participant’s calculated weight maintenance intake.15 In addition, a 30-day supply of orlistat (120 mg before meals 3 times a day) was provided monthly. Notice something? The low-carb diet had no restriction in calories but the low fat diet followed the usual protocol of eating below your maintenance caloric intake (along with the usual less than 10% saturated daily fat and less than 300 mg daily cholesterol. So what were the results? Despite the different diets, both groups lost similar weight with no statistical differences. Additionally, triglycerides, LDL-C, HDL-C improved in both groups with no statistical differences either (remember tho, the LDL/HDL cholesterol isn’t the true benchmark, its the particles but no lipoprotein particle testing was done here). Additionally, TheFatNurse thought the Hemoglobin A1c1% change was pretty interesting. A1C1 measures your sugar levels for the past 3 months and in this study the percent of change was -0.30 (CI; -0.52 to -0.09) for the low carb diet compared to the -0.06 (CI; -0.36 to +0.14) for the low fat diet with orlistat. That’s a pretty good change, although it wasn’t statistically significant (P=0.10); This means there’s a 10% probability that the differences were due to chance. Just an interesting observation. Perhaps the most interesting portion was the Blood pressure readings. The low carb diet won out with a difference of (in mm Hg) -7.44 (CI;-11.12 to -3.75) systolic and -4.97 (CI;-7.64 to -2.29) diastolic. with P values for both <.001. People eating the low fat diet with Orlistat actually increased their blood pressure on average. When one thinks about the diet composition of the low carb group with the results its pretty interesting. Remember the instructions, “eat unlimited meat and eggs.” This translated to the low carb group eating not only more calories in general, but almost double the amount of total fat on a daily basis. As for saturated fat? The low carb group ate a little bit more than double the saturated fat on average daily than the low fat group. Cholesterol intake? Well over double on average compared to the low fat group. Bottomline: TheFatNurse is not against low fat per se, just against the stigma that fat has gotten in today’s society. Additionally, please don’t make the mistake of treating this study as a low fat vs low carb high fat diet (LCHF) fight because the inclusion of orlistat makes true comparisons difficult. Not to mention this is just one study. TheFatNurse used this study to show results can run contrary to what is taught about eating fat and changes inside the body. 2) B. Grunfeld, M. Gimenez, M. Balzaretti, L. Rabinovich, M. Romo, and R. Simsolo (1995) Insulin Effect on Renal Sodium Reabsorption in Adolescent Offspring of Essential Hypertensive Parents. Hypertension 26 1089-1092. Posted on July 5, 2012 by thefatnurse Tagged cholesterolComicDietDr. DayspringHDLhdl cholesterolHDL-Phealthheart diseaseLDLLDL-PparticlesPeter AttiaTheFatNurse	Comments1 Comment on HDL for all ages! HDL cholesterol is often touted as a super stud in heart disease prevention. As a result, common knowledge has continually stressed increasing one’s HDL cholesterol without really moving beyond the “HDL Good LDL Bad” message. This belief can target researchers as well, but some recent studies, as covered by Peter Attia, reveal HDL cholesterol and heart disease not being as clear cut as one might believe. As a result, TheFatNurse thought it would be a good idea to go over some simple basics about what exactly HDL is and does in your body through a comic. This comic is based on a series of lectures by Dr. Thomas Dayspring and is only a simplified version of his more detailed analysis. See below if you’re itching to read Dr. Daysprings more detailed lectures! TheFatNurse also wants to extend a personal thank you to Dr. Dayspring. TheFatNurse is still beginning his journey in exploring all things lipid and Dr. Dayspring your encouragement, feedback and information have made exploration exciting. Before reading, TheFatNurse recommends you read the first two comics on cholesterol as it builds upon some knowledge needed for this third comic. Click here to read the HDL comic (semi-long read!) or the picture below. ***For the first two comics see: #1 Cholesterol For All Ages and #2 Cardiovascular Markers For All Ages. Interested in more? TheFatNurse highly recommends you look up Dr. Dayspring’s lectures on HDL which you can start with here and here.